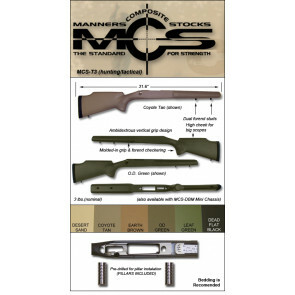 Manners has come out with one of the toughest and accurate stocks on the market today for Winchester 70 Rifles. This stock is for the FN/ Winchester 70 short action. It is inlet for the factory FN PBR Detachable box magazine and heavy varmint barrel. It is in the Dead Flat Black. This stock has some minor damage to the top of the cheekpiece and that is why it is being clearanced out.